Day 9: We can't believe the trip is ending. What a trip it has been! Ola from the Hounds at our last day in Portugal! We have had a great time here in Portugal and earlier in Spain! It has been an amazing trip with lots of amazing memories! Today we traveled to Lisbon to take a 3 hour sail boat ride along the coast of Portugal. Despite the misty weather and clouds, we had a great time seeing Portugal from the water! After sailing we walked around a town called Belem and grabbed a quick lunch before sitting down at Pasteis de Belem pastry shop to have their famous ***** pastries. We then rode back to Lisbon to go to the Oceanario de Lisboa, or the Aquarium of Lisbon, which is the second largest aquarium in the world. Our travels in Lisbon continued when we finished the day off with a nice team dinner. It was a long, fun day with the greatest team on earth. I can't believe this trip is already over! There were so many memories made here in Europe to love and cherish for years to come. My favorite memory was walking around Madrid after the Champions League Final between Real Madrid and Atletico Madrid. The atmosphere was unmatched by any other sporting event I have seen. It was great to be apart of the Madrid soccer culture for a night! Thanks for following us on our travels through Europe and our great experiences! My favorite part of the trip was being in Madrid before, during, and after Real Madrid's huge win. The energy in the city was great and the crowd that gathered afterwards was massive. It was truly a once in a lifetime chance to experience a such an important win while being in the winning team's city. The most memorable part of this trip was when we got to experience the huge win in Madrid. It honestly was one of the best experiences of my life and I could have not asked anything better to end my time in Madrid. If I could relive that night over and over again I absolutely would! Nothing will ever compare to the atmosphere of that night, just the people cheering and celebrating was amazing. There are so many memories from this amazing experience that it is very difficult to choose just one to write about. However, I have to say taking a tour of Toledo was my absolute favorite part of this trip. The city was very quiet but had a lot to offer. The scenery was gorgeous. It seemed as if it was taken out of a painting and the food was delicious. It was a great memory that I will cherish forever. The past ten days have been absolutely wonderful here in Europe. Seeing amazing breathtaking cities, tasting amazing food, and spending time with wonderful people players, coaches, parents, and tour guides alike. My favorite part of this experience was being able to spend time and get to know everyone a little bit better. Also the Futbol Championship Match in Madrid was cool too! It's been a such a great experience and I am truly sad to see it end but I look forward to a spectacular final basketball season for me, which is right around the corner! I really enjoyed hanging on the beach, paddle-boarding and playing against great teams in Lisbon. Even though we weren't able to get the wins we wanted, it was absolutely a great opportunity for our team to play together and an awesome experience competing with teams who had former WNBA players and girls who will be playing Division I basketball in the states. Overall the trip was amazing and I don't think I really have a favorite part. Madrid and Lisbon were both beautiful and fun! Can't believe our trip is coming to a close, but I had the best time! I am thrilled that I was able to have the opportunity to go on this trip. It was an absolutely amazing experience to see some beautiful places and to try new foods that I have never eaten before. Being able to play against a former WNBA player and a soon to be Division I player was awesome. I believe my favorite part of the trip was going to the beautiful beaches in Portugal. Also going downtown in Madrid after the big win was an experience that I will never forget. All in all the trip was great and I am glad that I got to spend it with my teammates and coaches. Sadly the trip is coming to an end, but this is one I will never forget! This trip to Spain and Portugal was an eye opener to many new experiences and opportunities. It was great to see different cities such as Lisbon and Madrid. The food was all really wonderful as well. Being in these different countries made me try new types of food and let me see that there was more than just the American food I have been eating for the past 18 years. Playing basketball here has to be my favorite memory. Being able to play against a former WNBA player and meeting other girls from Spain and Portugal was something that I will always remember. It was nice to know that my teammates were with me every step of the way throughout this experience. I could not think of a better group of girls to share this with. Overall this trip has made me step out of my comfort zone and and see new things for a change. I could never forget the impact that this trip will have on me for the rest of my life. This trip to Spain and Portugal was definitely an amazing experience. We all experienced new things and new opportunities. My favorite part of the trip was exploring Toledo. It was a view I will never forget. Besides Toledo, I really enjoyed being a part of the celebration in Madrid after the big win. Besides all of the sight seeing and exploring, we managed to play three games. Even though we did not win these games, they were all a learning experience. We played against girls around our age and even a former WNBA player. I thought playing here was something I will never forget in all my years of playing basketball. I also thought having my mom here was nice. It was good having her around and I know my teammates and coaches enjoyed her company also. I am so happy i got to experience this trip and i would not have wanted it with any other team! From the only mom (parent): what an absolute privilege it was to travel to Spain and Portugal with the Moravian Women's Basketball team. To the Green's: your company and conversations were quite memorable, i.e. the "broken shoe". This was all made possible by the coaches and I say thank you. I hope you continue to explore the world with your future players. The memories and laughs that I have made will stay with me forever. This whole trip was a once in the lifetime experience. I could not have been more indebted having this opportunity and want to thank my parents for this amazing exposure to new two new cultures. As for this being my first time in Europe I would not have wanted it to be with any other group of people. I cannot decide on my favorite or most memorable part of this trip but I do have a top 3! I will never forget while in Madrid experiencing the celebration of the city during the championship league final; the streets were packed with people cheering. I cannot believe I have had the chance to play against some of the best basketball players from Spain and Portugal and this is something I am proud to say I have done. I also enjoyed participating in the scavenger hunt throughout Madrid that our coaches created for us. With all my scenic photos and selfies I hope to create a scrapbook when I get home and I also want to say thank you to Mrs. Weiss and Mr. and Mrs. Green for coming along on this journey it was a pleasure to have you and your support with us! Another thanks to our coaches for making this possible for all of us and I hope all of our followers have enjoyed the pictures that have been posted and reading our blog. Unfortunately our trip has come to an end, but it is one I will never forget!! I could not be more grateful to have gone on such an incredible trip with the people I am surrounded by. The memories I made will last a lifetime. Whether it's raging in the square after the big soccer game in Madrid or soaking up the sun on the coast of Portugal, everyone involved in making this trip happen has made it the time of my life and I thank you all for that. Although I enjoyed Portugal, Spain was my favorite of the two countries we visited on this trip. Maybe it is my favoritism towards the city, but Madrid was alive and beautiful and I enjoyed every second of exploring it. I'm grateful to have the opportunity to study the norms of these two cultures, as well as the differences in ours and theirs. It astounds me how much they adore soccer compared to the way Americans do. I would also like to thank the coaches for making this trip so special and keeping us busy the entire time, as well as Pedro, Sally, the Green's and Mrs. Weiss, it was a joy getting to know each one of you a bit more. Although I'm sad to leave, I'm happy I could come on this trip and make memories with some of my best friends. One of the two boats that we sailed on today. I would like to start off by saying thank you to everyone that is following our blog while we are in Spain and Portugal. We are eight days into our trip and the experience continues to get better! Today we started the morning off with a long bike ride along the coast. We were all very excited and slightly shocked when we found out that we could rent bikes for free. Our bike ride began a bit bumpy as we had to navigate our way through the cobblestone streets before reaching the bike path. After pedaling for 8km (5 miles) right next to the ocean, we reached our destination; a secluded beach with breathtaking views. Our awesome tour guide, Pedro, planned this excursion for us as he knew it would not disappoint. We ended up only being a few hundred meters away from the most western point of Europe. While at the beach, Karlee, Emily, Marie, Alesha, Nellie, Courtney, Pedro, and I took a swim in the frigid Atlantic Ocean. I do not think the water temperatures were much colder than the ocean water in the northeast right now but it was quite a shock when we first jumped in. Several others took the opportunity to take pictures and play some beach tennis. After about a half hour at the beach we began our bike ride back to our hotel. When we returned to our hotel, everyone was very hungry and ready for lunch. The girls found various spots to grab lunch and then spent the rest of the afternoon shopping and napping. The adults ate at a delicious portuguese restaurant that was unknown to tourists. Knowing the local cuisine so well, Pedro has been in charge of picking the restaurants for all of our meals. He has not failed us yet! Today's lunch consisted of clams, octopus salad, and sausages for starters and then everyone tried the prego sandwich. This portuguese staple is comparable to a thin piece of steak on a roll. Following lunch, we returned to our favorite gelado place, Santini. The coaches and Sallie are hoping that they will consider franchising to Bethlehem and Milwaukee (where Sallie is from) because it is so good! This evening, we had our last game of the trip. Although it was not the result we were hoping for, we did some great things. The team we played against was tall and very skilled. On a positive note, I thought we improved each game we played. After the game, we took a few pictures and chatted with the other team before returning to Cascais. We went straight to the marina for a late dinner as a team. Again, Pedro led the way and took us to a great restaurant. I decided to order pizza with mushroom, pineapple, and banana on it. Surprisingly, it was delicious! I am hoping there is a place in the United States that will serve pizza with banana! I am really looking forward to tomorrow's adventure. We are taking a private sailing trip around Belem, an historical beach town in Portugal. I hear that Belem is famous for a pastry and I will definitely be trying it! After the tour, we are heading to Lisbon to visit the Oceanario, the second largest aquarium in the world. We will conclude our day with a team dinner on our last night abroad. It is very late here so it is time for me to get some rest for tomorrow's busy day. Thank you for following along with us! Morgan, Emily, Marie, Alesha, and Karlee enjoying the Atlantic Ocean! Tristen, Cori, Natalie, Courtney, and Nellie take the opportunity to capture photos at the scenic beach. Team picture with our opponents. Enjoying our daily dose of gelado from Santini! Ola! This is day 8 of our adventures in Europe. This morning we took a train from Cascais to Lisbon. It was a short and smooth ride. When we arrived there was four Eco Tuk Tour cars and four pretty awesome tour guides to welcome us and begin showing us the beautiful city of Lisbon. These cars fit up to 6 people and were eco-friendly. We traveled the city for most of the day and saw some amazing views. The architecture among the buildings were very detailed and beautiful. The city had a massive Earthquake and destroyed most of the buildings in Lisbon. Our tour guides made this tour fun and interesting with the facts and personalities. After the tour we had the afternoon to ourselves to explore more of the city. We went shopping, had lunch, and even ran into one of the tour guides again LOL. Today was another fun-filled day in Portugal with the sun, laughter, and plenty of selfies. Now, we have the rest of the evening to relax and hangout before another adventure tomorrow! Até logo! Ola! This is Natalie and Cori writing from the lobby of our hotel in Casias, Portugal. The day started off with a late morning, and we were all glad to have the chance to sleep in after yesterday’s bus ride. After eating breakfast outside, with a great view of the ocean, the team headed to the beach. Some took advantage of the paddle boards, while others sat in the sun. From there, some of us went for lunch and shopping while some of us relaxed by the rooftop pool. It was a laid back day until we took a half hour bus ride along the beautiful Portugese coast line to our game at Sport Alges E Dafundo against a 19 and under team. After a rough battle, we unfortunately did not come out on top. However, after the game we exchanged shirts, took selfies, and make international connections and friendships with the other team. After the game we headed out to eat pizza, omelets, and other authentic foods. Being here on Memorial Day has not caused us to forget those who have fought for our country. Happy Memorial Day and thus concludes day six of our European adventures. Peace out and goodnight. View from the 70’s: This is Mary Lou Green writing now. Jim and I are impressed with the enthusiasm of the team. They are cheerful, bouncy, eager for new experiences, and in great athletic shape. They take care of each other. And, there is never a dull moment! The prep work done by the coaches is impressive. They, along with manager Jackiee, make sure that each day goes well. Of course this is all accomplished through the terrific thinking and planning done by our guides Pedro and Sallie. And did I mention that we are all eating well? This includes squid, octopus and fish eyes. Yes, you’ll have to ask the students about this! We are getting a broad sampler of Spanish culture. Our day planned for the Prado Museum included a side excursion by Jim, Janet Weiss and me to the Reina Sofia where we saw Picasso’s Guernica painting of the horrors of war created by the fighting in Guernica. Back at the Prado, we were overwhelmed and figured that maybe spending a year going through that museum would be good. At El Rasto enjoyed the colors, designs and variety of people. Our experience in Spain has been more intense than our experience in Portugal. We are now in a country with a different pace. We are sure that our views of life will and are already enhanced by this experience. Jim and Mary Lou Green enjoying the view! Our faithful fans and travelers getting their official Greyhound pins. Dia Cinco: On the road to Portugal. Ola! This is Tristen and Jackiee coming from Cascais, Portugal. This morning we had an early morning in Madrid. 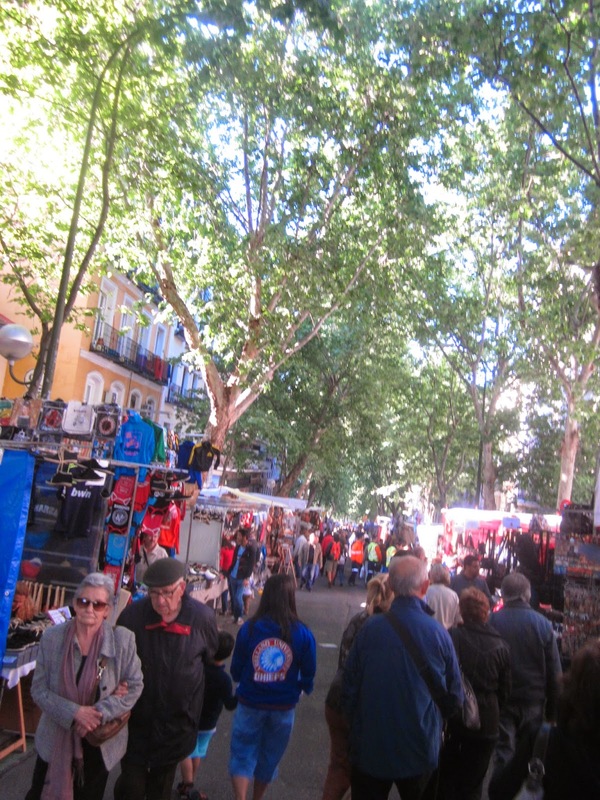 We took the metro to the El Rastro flea market. We walked around and people bought scarves, jewelry, bags, and clothing. We were there for a couple of hours and the atmosphere and experience was great. Then as we got back a couple of people headed to the store futbol mania to buy last minute souvenirs. Then we all headed on the long bus ride to Lisbon. The bus had to stop every few hours because of European laws that they are only allowed to drive for a certain amount of hours at a time. We stopped at something similar to a truck stop, but it was an actual restaurant. We then got back on the bus and headed to Portugal and checked into our hotel, which is really nice! For dinner we all went out to a buffet near the hotel. The food was delicious and authentic. The best part of the dinner was when our tour guide Pedro brought his kids and wife to meet all of us. We are back at the hotel now in the playroom playing cards like little kids all having a good time and bonding. We’re looking forward to a beach day tomorrow before our game. Hasta Luego! At the rest stop, still in Spain. Finally in Portugal! After our team dinner. Pedro's wife and daughter sneak in the background. Dia Quatro: Prado Museum and European Futbol Championships. Hola! This is Marie coming to you live from the bus on our way to Portugal! Yesterday morning we took a nice walk through the streets of Madrid to go to the Museo de Prado. We all got to experience wonderful and majestic art pieces from Spanish painters from the Renaissance as well as German and Flemish painters. After the exciting day at the museum we all had time to explore, shop and of course our favorite activity to do eat. We then freshened up at the hotel for our exciting dinner at a tapas restaurant that our tour guide, Pedro made reservations for. While eating a delicious paella dinner we got to watch the European League Futbol Championship between Real Madrid and Madrid Athletico! It was a GREAT game to watch! It went into overtime but Real Madrid came up with the win, very exciting! The score was 4-1! That was the first time I ever watched an entire soccer game. The city went loco! 500,000 people flooded the streets of Madrid and we were right there celebrating with them! We all are very excited to go to Lisbon, Portugal! Adios! Walking down Gran Via celebrating with the crowd! Celebration continues, Go Real Madrid! 10th European Cup! What: Moravian College's Women's Basketball Team will be exploring Plaza Mayor; taking a bus trip to the city of Toledo a World Heritage Site; visiting the Prado Museum; competing in two games while in Madrid; staying in the coastal town of Cascais, Portugal; touring Lisbon; and playing one game while in Portugal.